Click on the picture to enlarge and read. Scroll down to read the English translation. 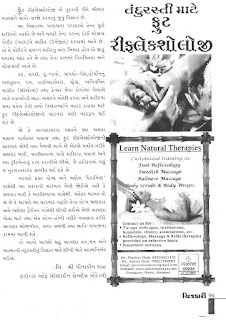 Foot Reflexology is an ancient science used for healing a person in a natural way. In Reflexology, the feet are a map of the whole body and when a point on the feet is stimulated, it triggers better functioning and healing in the corresponding part of the body. Reflexology helps in cough, cold, pain relief, improved digestion, hormonal balance, Asthma, high blood pressure, stress, PMS, reducing side effects of strong medication in cases like cancer and also removes toxins from the body, etc. We all live very stressful lives and require these natural therapies to remain healthy. However, many of us may find Reflexology and Massage in spas to be too expensive and luxurious. So, we get treatment at home from untrained bais and malishwalas, which is very harmful. We should get treatment only from qualified therapists or, better still, we can learn the therapy for ourselves and use it as a profession or a hobby to heal family and friends. So let us become self-sufficient and learn to care for our own body, mind and spirit.